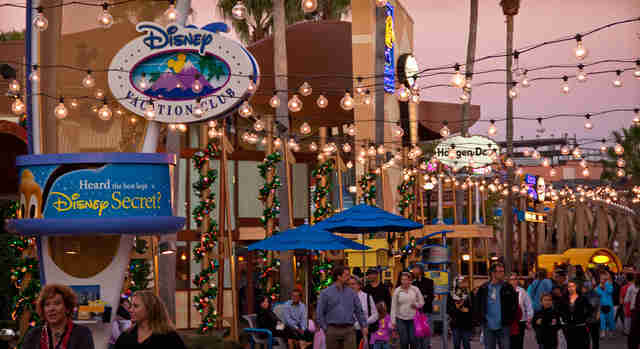 It's easy to have a great vacation at Walt Disney World as an adult, but why stop there? Why not attempt the impossible: avoiding the screaming kids, the strollers, the frazzled parents, altogether? Sounds like a pipe dream, right? I mean, the place is designed FOR KIDS!!! 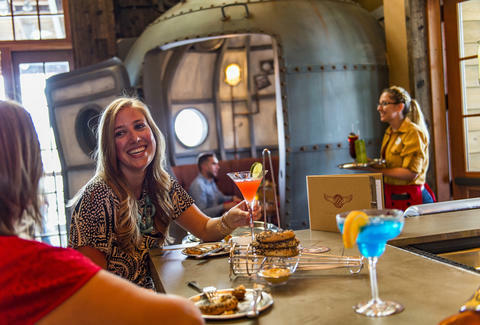 Believe it or not, it's totally possible to enjoy themed drinks, roller coasters, and corn dogs without suffering flashbacks of being fired from your summer job as a camp counselor, and we're ready to prove it. Here are 10 ways to have the perfect trip to Walt Disney World without -- gulp -- encountering children. Walt Disney World Resort guests receive exclusive access to the parks both before and after regular operating hours as one of their perks -- it's called Extra Magic Hours. And while they vary by day, week, and park, it can often mean getting in as early as 8am or staying as late as 2am. Whatever you do, though: never, ever, ever go before the park opens -- families wake up at the crack of dawn for this stuff. In fact, on days where they offer these early hours, you should visit late in the day. (If the kids woke up at 6:45am to get to the Magic Kingdom, there's no way they'll be there into the night, you know?) 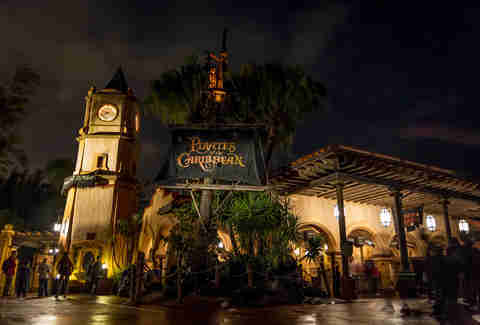 Nights mean fewer kids, in general, but throw in Extra Magic Hours and anything after 10:30pm -- following the evening shows -- is prime time for childless adults. And no, this doesn't mean sitting inside The Hall of Presidents for the day. Gotta check your work email? Do it aboard the Magic Kingdom's PeopleMover instead of in the massive parade crowd on Main St. Want a little culture before your next ride? Check out the museum-quality exhibits within each Epcot territory, which are often empty and probably shouldn't be. Curious about Disney history? 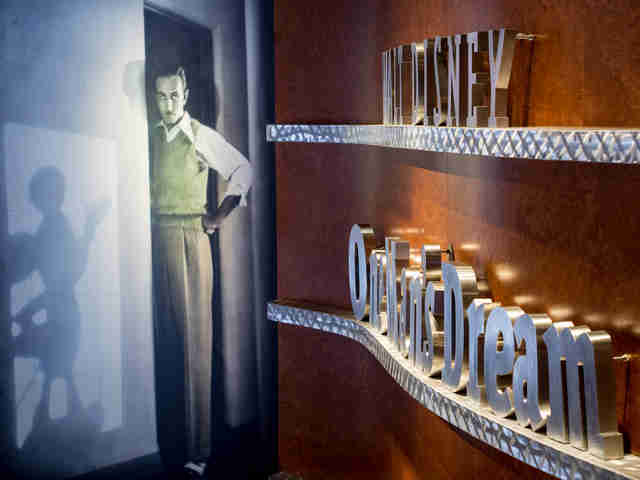 Walt Disney: One Man's Dream at Hollywood Studios will kind of blow your brain when you learn the parks very easily might never have been built. And, once you're back at your hotel, head straight for one of Disney's massive hot tubs -- between the pool-bar drinks and crew of adults that are always tubbin', kids will be a distant memory. Or, in other words, in restaurants where parents could find any reason not to bring their family. California Grill is a safe bet for its high price point, while Morimoto Asia and Jiko - The Cooking Place offer incredible Asian- and African-inspired plates that are just aggressive enough to potentially scare parents with picky eaters away. Stop by Magic Kingdom's Skipper Canteen if you can, too -- the menu of shu mai dumplings, arepas, and head-on shrimp (!) is as delectably kid-averse as you’re going to get inside the parks. Disney transportation, which is offered free to resort guests, is ground zero for encountering a sea of children. And taking the monorail, boat, or tram to reach the gates ensures you'll come face to face with more young ones than at the local daycare. Whenever possible, lace up your Rockports and trek there -- Epcot and Hollywood Studios are actually walkable between each other, and tuckered-out little kids probably won't do -- or utilize hired cars to move around the grounds in privacy. For Epcot, get dropped off at the Beach Club Resort and walk to the International Gateway to enter; and for Magic Kingdom, try to get dropped at the Contemporary Resort, which has a little-known walking path between the hotel and the park. (Animal Kingdom and Hollywood Studios have designated drop-off/pick-up sections, so use those.) Uber is much cheaper than WDW taxis, but the latter are ready and available -- so take your pick. 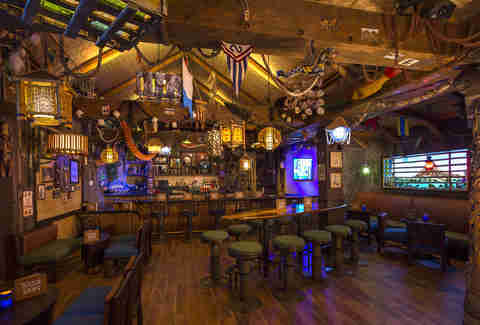 And then, of course, there's Trader Sam's Grog Grotto at the Polynesian Village Resort. This Tiki outpost is so legit it'd be worth visiting even if toddlers were mixing the drinks (hilarious mental picture). But don't worry, they won't be -- kids know nothing about which bitters go best with bourbon. Also, it's Disney World's only bar that restricts youngins from entering, and while the outdoor patio welcomes families all night long, the Grotto is strictly 21+ after 8pm. Your suitcase should be 30% granola bars. Why? Because the last thing you want is to be hungry in the park and fighting the masses for an ice cream cone. Bring a few extra snacks to avoid waiting in afternoon food cart lines, and hit the in-park Starbucks sooner rather than later to avoid the 11am Frappuccino crowd. Skew late for dinner reservations outside the parks -- or schedule meals that overlap with the fireworks and evening shows when inside -- and you should avoid kids menus and crayons. Though you may remember it as offering fresh heaps of edu-tainment, Epcot is the secret raging party you never knew was happening. 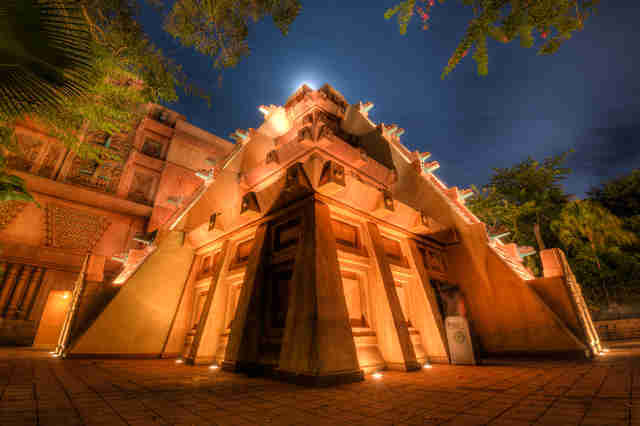 La Cava del Tequila, located inside Epcot's Mexico Pavilion, is where bachelorette parties and crazy 20-somethings go to sip on avocado margaritas, eat guacamole, and knock back 200 different kinds of tequila. The bar at Spice Road Table within the Morocco Pavilion can also get poppin', and once the live music begins and the Guinness starts flowing at Rose & Crown Pub in Epcot's UK, all bets are off. Save for Halloween and Christmas, any time you have to pony up for an additional ticket guarantees there'll be fewer families. Adults specifically come to town for the Epcot Food and Wine Festival, where the beverage seminars and culinary demonstrations are likely to be low on little ones (really just those trying to get a leg up on the MasterChef Junior auditions, right? ), and the free-flowing libations near the World Showcase at least make it worth sharing the space with them. Disney Parks also recently introduced Disney After Hours dates thru May (different from the aforementioned Extra Hours), which grant a minuscule number of guests access to a closed Magic Kingdom for three hours for $149 a head. Supposedly, it feels like a ghost town in there -- no lines! No waits! -- so if you want to ride the kid-beloved Seven Dwarfs Mine Train without seeing a single underage soul, this is the only way to do it. Want to do all the kids stuff but without the kids? Fine, go ahead, make it tough on us! Your best bet is to college exam-level study the park's schedule, figure out what families would want to do, and do the exact opposite. Obviously, easier said than done, but when Hollywood Studios' "Fantasmic!" 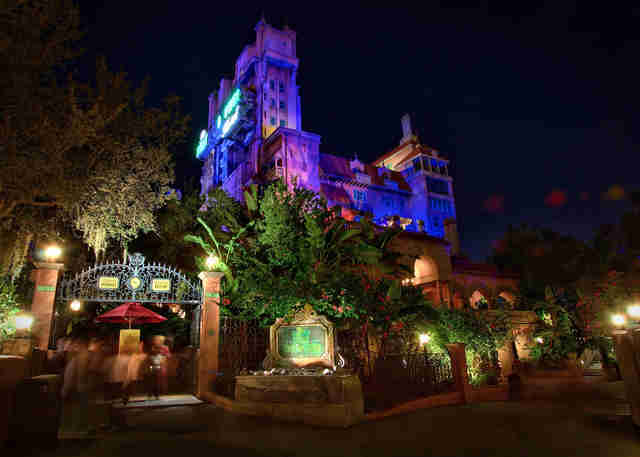 begins, hop in line for Tower of Terror or Star Tours, where lines will be shorter. Want to watch the evening Star Wars fireworks? Do so from the tables outside Min and Bill's Dockside Diner, where the crowds are thin. If there are two options for parades or shows, like with Magic Kingdom's "Celebrate the Magic," always catch the later showing. And view the "Wishes" fireworks show from the waterside walkway between Liberty Square and Frontierland, as the crowd is bare-bones but the view still good. Ride wait times can be significantly shorter during evening entertainment, so take advantage and get your dose of nostalgia before you swiftly become the tallest person in line. Carlye Wisel is a Disney writer who is so newly obsessed with theme parks that her loved ones are likely planning an intervention. She doesn't update her blog, Awkward City, but somehow posts on Instagram @CarlyeWisel way too often.